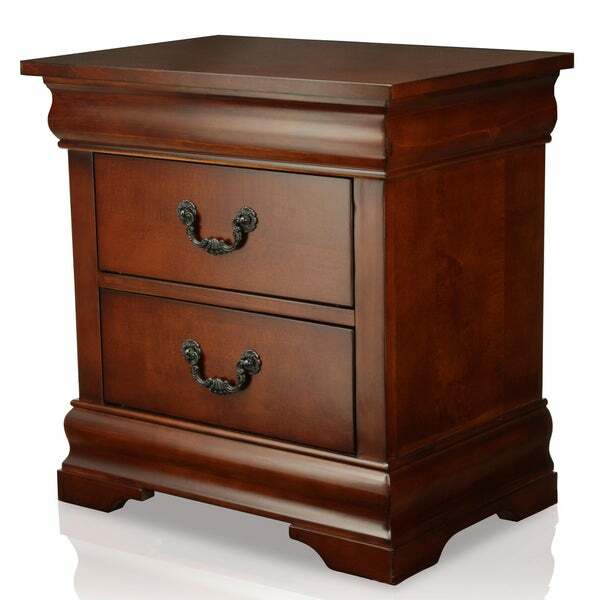 Add classic elegance to your bedroom with this English-style two-drawer nightstand. This nightstand features two spacious drawers for various night time necessities. The topdrawer is lined with velvet, making it a perfect place to storemore delicate items. The solid wood and veneer construction adds stability and strength. Dimensions 23.75 In. X 16.0 In. X 24.0 In. Not as cherry wood as I would have liked....has more of an orange tint to it but still a beautiful piece of furniture. I like the felt padding in the top drawer. We really like these nightstands. They are very sturdy, didn't require any assembly and look beautiful. One aspect that I was somewhat disappointed with is the fact that they are very dark. I was hoping for a somewhat lighter color and these are dark. Drawers work well and they are very solid. Mom loved her English Style 2Drawer Nightstand. All we had to do was take it out of the box. Well-made. Good price. This bedside table is just what I wanted and expected. It's attractive wood finish and smooth drawer function are just what I wanted. It looks terrific in our guest room and matches our current furniture perfectly. The nightstand arrived in perfect condition without a single nick or scratch. I'm very pleased with this piece. I ordered two of these nightstands. Both arrived in excellent condition. We had doubts on how real is the color of wood shown in the picture is and we are pretty pleased. I would recommend this product to friends. Purchased this to go with my bedroom furniture, I had purchased one nightstand when we bought the set but needed another one for when we moved into our new house. Although they do not match perfectly, I am happy with my purchase. The nightstand seems to be of good quality and true to the photos. This is a very nice piece of furniture for the price. I know the description described wood but there's always pressed wood used for the back or whatever else. Let me tell you, this is a very heavy piece of furniture. Well made and beautiful. We purchased two to replace our old ugly night stands and WOW! Sturdy, Nice finish, No assembly at all. Bought this nightstand to go with an existing bed in our guest bedroom. I didn't know anything about the brand but since the finish was what I was looking for and decided since the price was reasonable I would give it a try. Good choice heavy well made wood nightstand that works well in the guest room. This is a very durable night stand. It is a good height and the drawers slide in and out smoothly. It is a great product for the price and the look. If I needed another one I would purchase this one again. Poor fits & thin finish. Mitered pieces show space at corners. Not well made, too light, and drawers don't slide easily. No assembly. Nice quality. Very happy with this purchase! Came packaged very well. There was no damage.lookes great. Medium matt cherry finish. Great quality for the price. Packed well. Looks great in the bedroom. Better than what I expected! Will have to order another! It looks antique which is nice, but the drawers are a bit hard. Maybe with time they'll loosen up. The nightstands Are just as describe-good quality. Match my cherry bed perfectly. Ordered 2 of these for their published sizes. Work great in Master bdrm as it is long and a little narrow. Stain and finish was poorly done. Overall construction is ok. Thought it might be better but will be ok for the spare bedroom. "do you have a chest of drawers to match"
"What are the overall dimensions of this piece?" "Is it solid cherry or veneer"
The frame is solid wood and the top surface is wood veneer. Cherry refers to the finish not the materials. "hi. is the back matching wood or particle board? thanks." The back of this item is unfinished. The weight is 37 lbs. "What are interior dimensions of the drawers? Thank you." The drawer dimension is approximately 14.25 inches W x 12.25 inches D x 4.25 inches H.
14 inches side to side: 12 1/4 inches front to back: 5 1/2 inches deep: Measurements are the same for both drawers, lots of room for books and other stuff. This is a beautifully made, expensive looking nightstand.